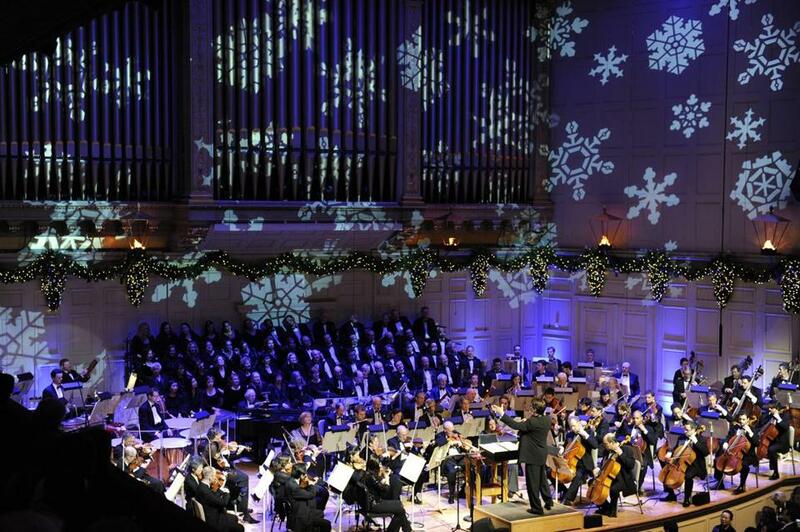 Keith Lockhart and the Boston Pops work together to make music more beautiful than any one of them could create by themselves. There is no peace on Earth. Never has been. Never will be. Not even now. Not even during this season when we sing about “Peace on Earth,” when the words, “joy” and “peace” and “good will” fill the airwaves, and are engraved on wooden plaques at Home Goods and greeting cards at The Paper Store. Peace on Earth, like the fairy-tale workshop at the North Pole packed with jovial, frolicking elves, simply does not exist. And yet, it is not all invention. There are many good people in this world who may not have pointy ears and wear pointy hats, but who are elves nonetheless, because they spread love and joy, and not just at Christmas but all year long. There are the well-known elves: the clown team at Boston Children’s Hospital that makes children laugh every day; My Brother’s Keeper, whose mission is to spread love and hope; Father Bill’s Place; Community Servings; School on Wheels; House of Possibilities; Women’s Lunch Place. This list goes on for pages. There are also so many other, unknown elves. All the quiet givers, the knitters, crocheters, bakers, nurturers, drivers, volunteers, listeners. “Here’s a little extra.” “I’ll drive you.” I’ll take you.” “I can do it.” “No problem. Call anytime.” Unheralded doers in what seems to be an increasingly crazy and selfish world. There are pockets of peace, too, despite what’s in the news every day; places on this volatile planet where the kernel of goodness we are born with gets to be nurtured and bloom. I was thinking about this goodness at the Holiday Pops a few weeks ago. I was at Symphony Hall and it struck me, as it does every time I am in this majestic building, how beauty can be made when people work together in peace. And that what we are supposed to learn from great beauty is that we are capable of doing great things. If we just stop fighting and arguing and upstaging; if, instead, we work as a team, this is what we get: Men and women all with their own instruments and techniques, all singularly excellent, creating a beautiful, unique, spectacular sound, which each musician alone, no matter how talented, could never make. By ourselves, there is so much we cannot do. But together? A small child sits on a parent’s shoulders and becomes, for as long as he is perched, a giant who gets a bird’s-eye view of a scene that had been nothing but legs and knees just seconds before. When people join together, even little people, the possibilities are limitless. The whole becomes not just greater than the sum of its parts. But a different entity. Christmas made me think of this, too. Families and friends came together, individuals with their histories, their stories, their separate personalities, their joys and gripes, their expectations. They brought a plate of cookies, a casserole, a bottle of wine, and something happened. A crazy mix of parents and stepparents, boyfriends and girlfriends, young and old combined, and something that didn’t exist before, and doesn’t exist now, was real for a while. A kind of stew that fed the soul, that fed each of us, but that will never be made again exactly as it was. “Let there be peace on Earth and let it begin with me.” That’s how Keith Lockhart concluded the Holiday Pops, inviting the audience to sing along. Everyone did.